You think I’m about to complain about the weather? 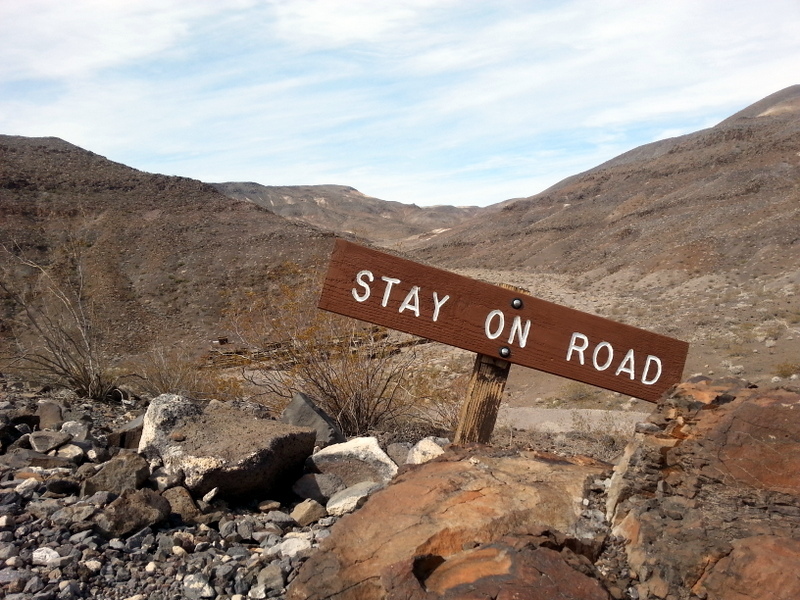 Nah….talkin’ about altitude here – we’re in Death Valley, the lowest spot in North America, at -286 feet below sea level. The storms that chased us from Prescott also ‘swamped’ Death Valley, providing them with enough moisture to account for about 20% of their total annual rainfall of 2″. The result is that much of the surface had an unpleasant mushy texture, with pools of brackish standing water in several places. It just doesn’t absorb as one would imagine that it might. Curious. 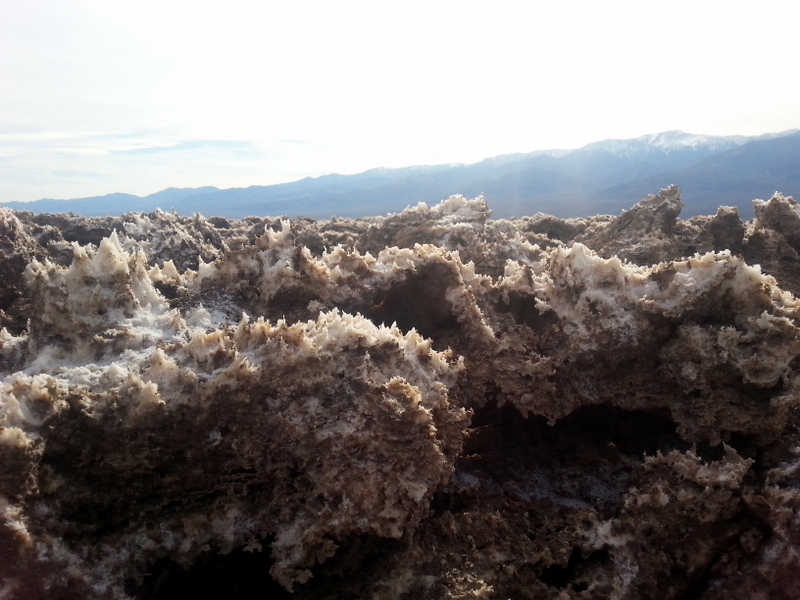 New salt crystals form every day, giving the landscape an odd puckery look. Death Valley has so many different features. We tried to take in all the sights in our three days there. 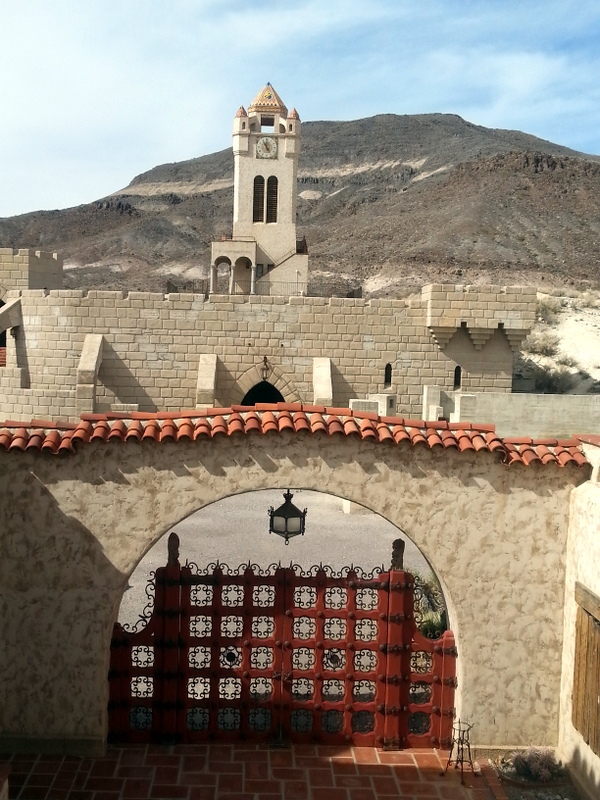 Scotty’s Castle is a mansion constructed around 100 years ago by wealthy Chicago businessman Albert Johnson. 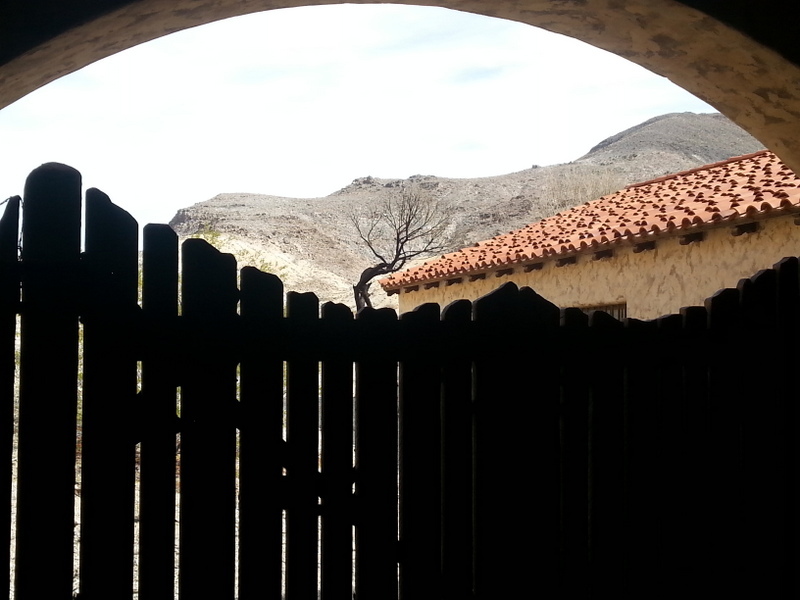 Johnson came to Death Valley to check out investments he had made with Walter Scott in Scott’s fake gold mine. 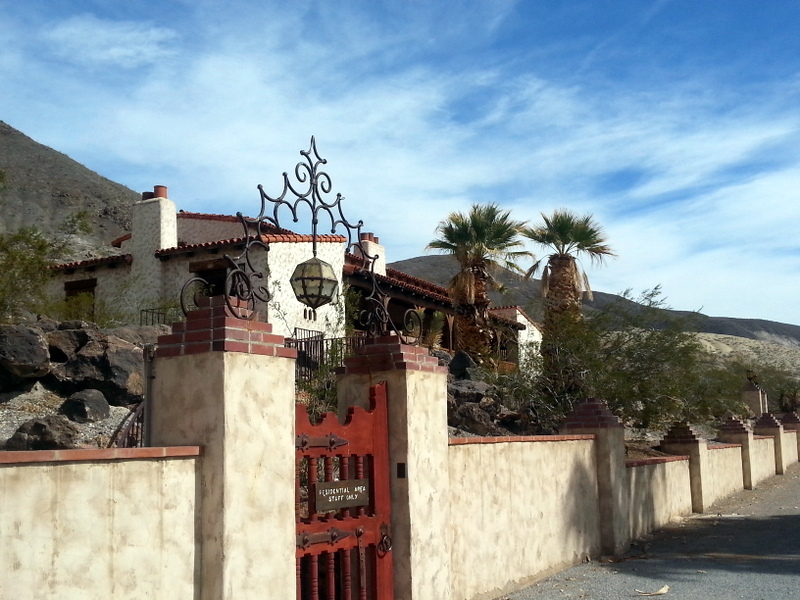 Instead of gold, he found a lifetime friendship with con artist Scotty, and a love for the desert, which prompted him to build his desert palace. 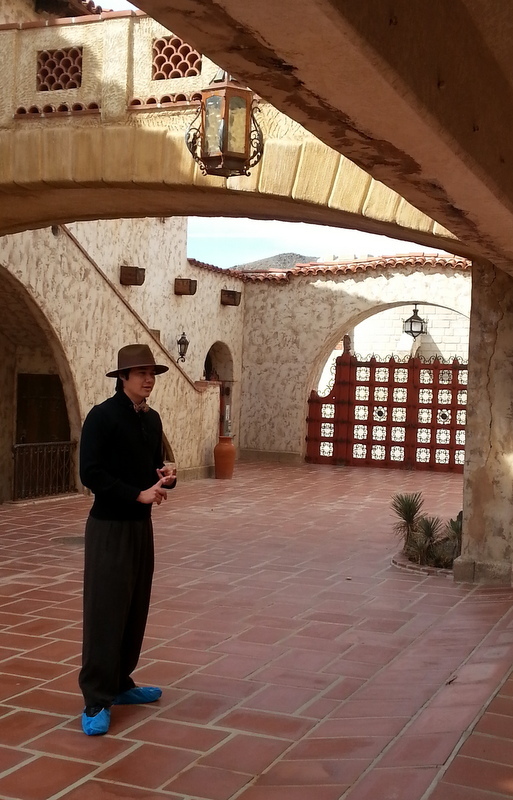 Tour guides are dressed as characters from the period – our guide took on the role of journalist. We also took the Underground Tour, which focused on many of the nuts & bolts of the construction. That tour was led by a guide in the role of construction worker. (We both seriously disliked her presentation – over-the-top phony). Couldn’t wait for it to be over. 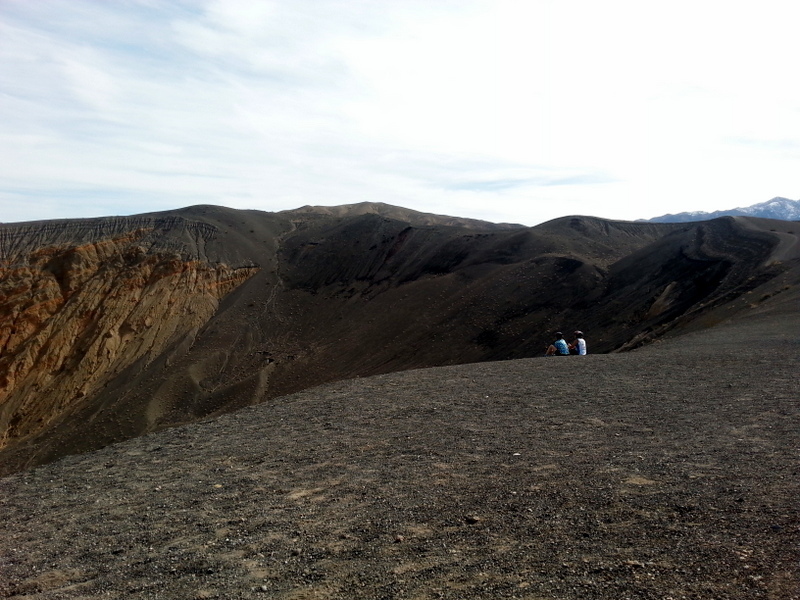 Perhaps my favorite feature of Death Valley was the Ubehebe Crater (u-bee-HE-bee), formed by a volcano 2000 years ago. Stark and beautiful. 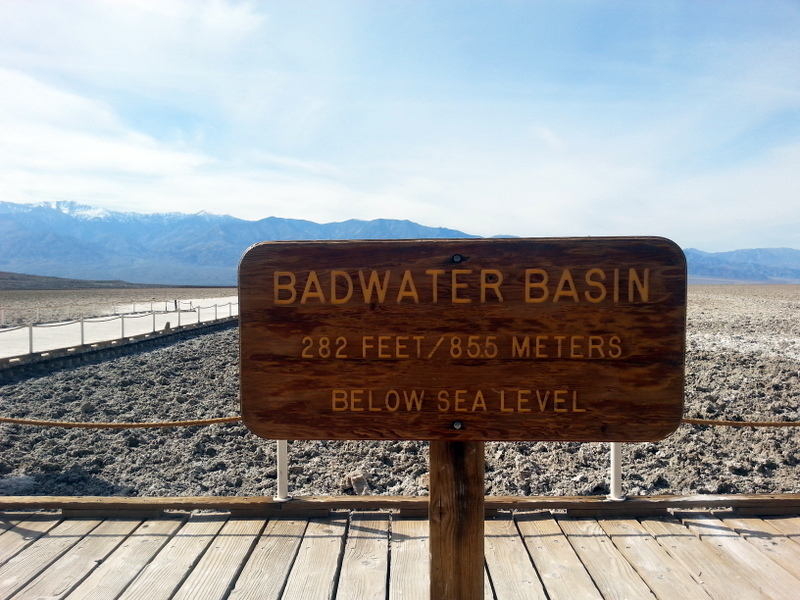 We cycled to Badwater Basin, the lowest point in the Park. We headed out with two water bottles each, on what we thought would be a 15 mile ride. Wrong-o! After riding about four miles, we discovered that the distance was more like 40 miles. So, we turned around, went back to the Fireball, and grabbed another gallon of water along with a package of Skratch Labs, our favorite electrolyte mix. A wise decision. Such a beautiful ride. I also detoured to the Devil’s Golf Course. This area looks like a flat, baked plain that someone ground up with a giant rototiller. The ground is heaved up, then crusted over with salt. 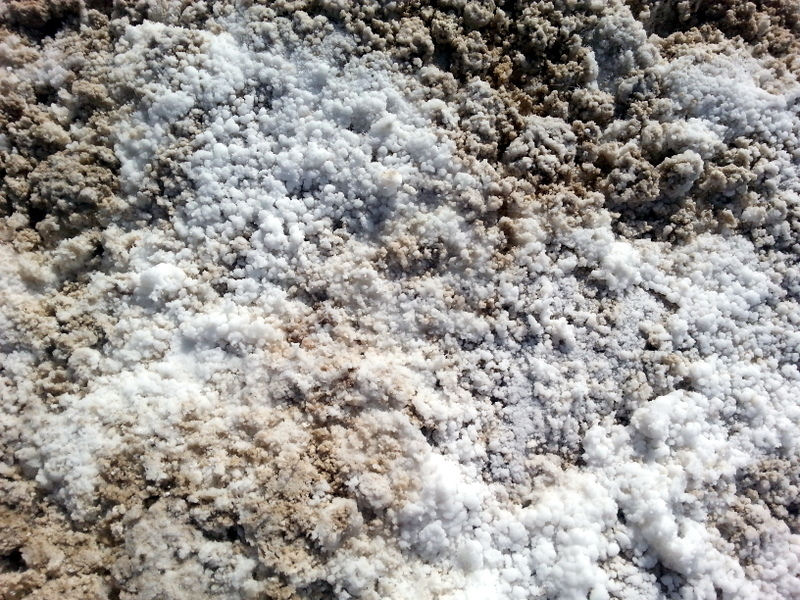 Walking across it, the salt crunches, but the ground doesn’t give. 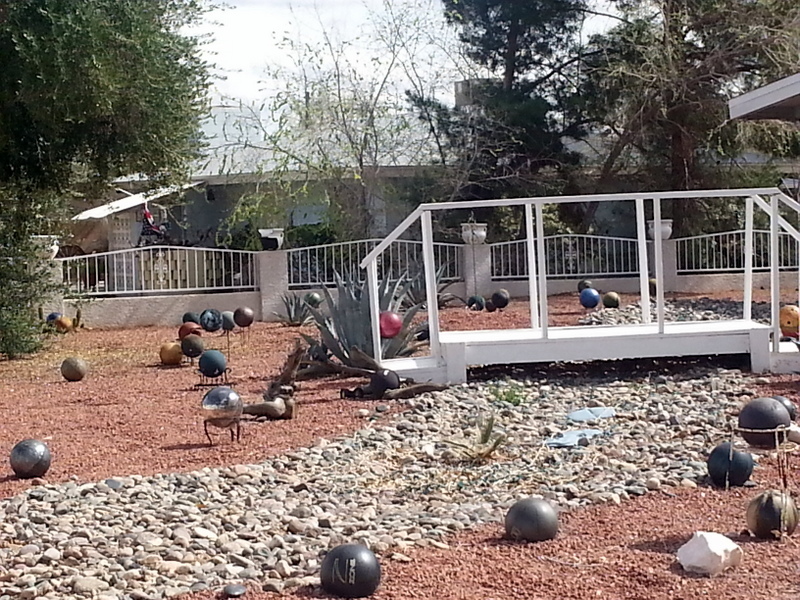 For comparison, here’s a shot from my sister’s neighborhood that I call Vegas Devil’s Golf Course. Our cycling day was probably the hottest day of our three there. We had put up our Visor awning on the opposite side of the Fireball, which faced south. With shades drawn, and our Cool Cat set on its airconditioning cycle, we felt comfortable in leaving Jezzy for the day. Temps rose to near 90 degrees that day, but all was comfy inside. 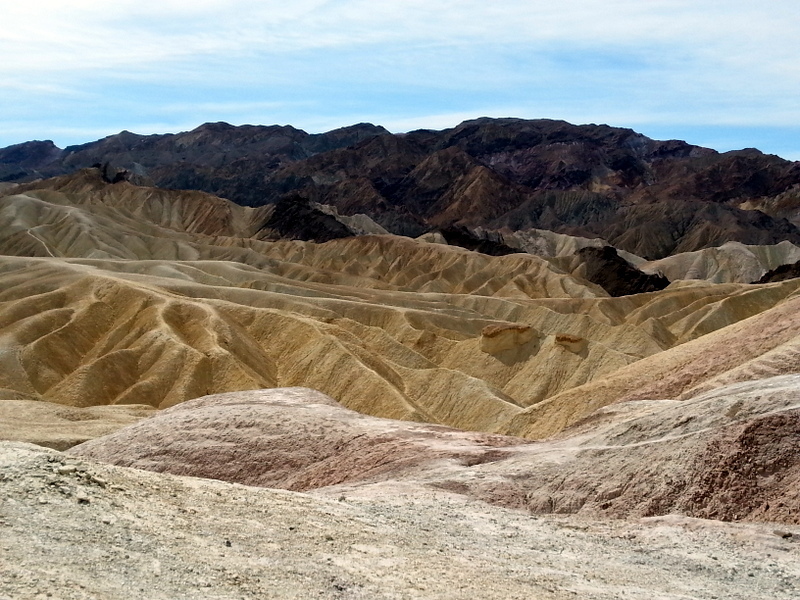 Zabriskie Point provides a view of the Valley that is unmatched. The white borax hills, salty floor, and snow-covered Telescope Peak are all in view. There is an eerie peacefulness about the place. Oddly enough, my turn at the top (John and I alternated, so that we could waltz Jezzy around outside, as it was too hot to leave her in the truck while we went to the top of the lookout) was marred by the Odd Family. This father and two daughters were walking around in their pajamas. He was a large guy, wearing red plaid cotton pjs and slippers. One of the girls was wearing a fleece onsie – complete with footies and long sleeves. It was 85 degrees outside!! Goofy. One last spot we visited we visited was the Harmony Borax Works. 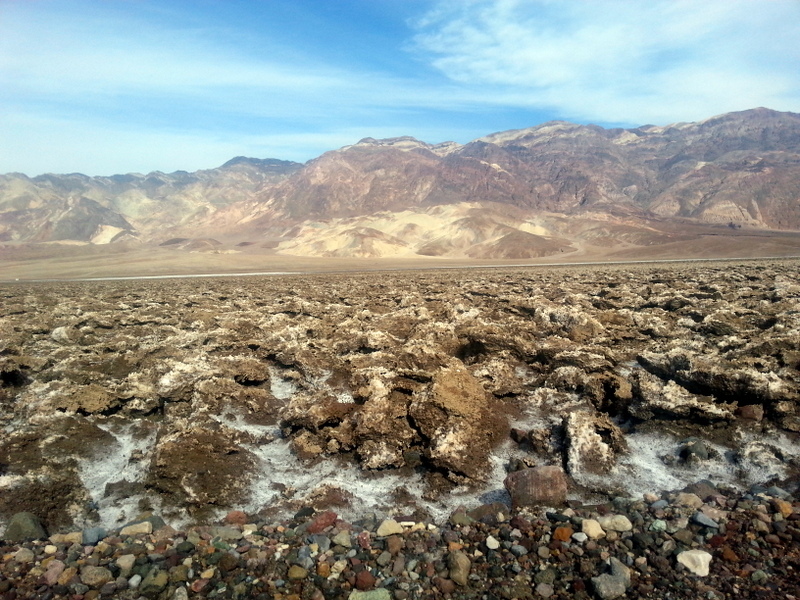 The white hills of Death Valley are borax, which was mined in the 1880s. Lots of interesting artifacts from the mining days remain. A Death Valley fixture appeared for two of our nights in camp. Mr. Kenney, a 90-year old bugler came to camp and played Taps. Apparently he had done this for years, but has been absent for most of the past two years. His notes were wavering and not strong, but true and sincere. Respectful applause came from all over the campground at the last note. It was a wonderful way to end a trip to one of the more unusual National Parks we’ve visited. 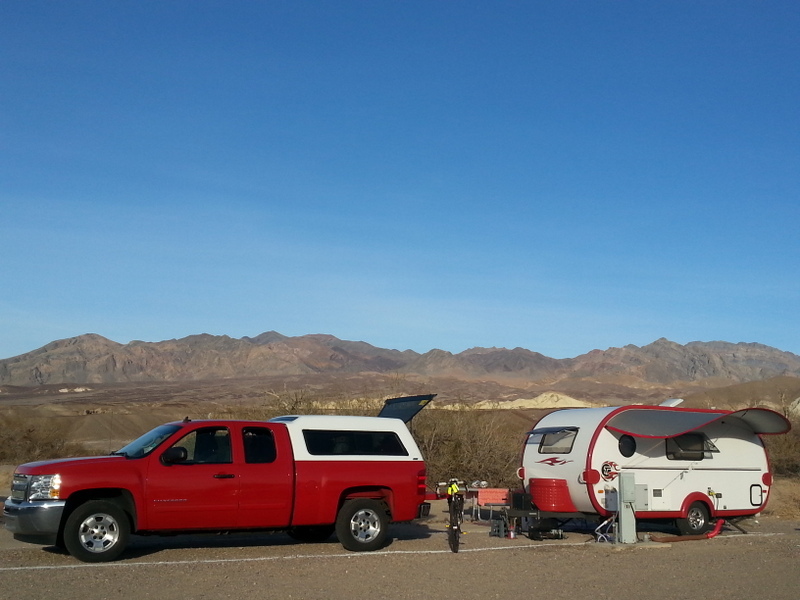 This entry was posted in California, camping, great outdoors, national parks, Nevada, retirement, RV life, simple camping, trailer modifications, weather and tagged California, camping, cycling, historic sites, national parks, retirement, road trip, RV life, simple camping, T@DA, the great outdoors, weather by Judy Crankshaw. Bookmark the permalink. What? That sounds insanely difficult. Is this a race? When? We were happy to have enough in the tank to get out of the Valley. It would have killed me to pay that much for gas. Wow you showed a death valley I’ve never seen. What a showing of earth at a different level. Jerry calculating a fill-up…wow! I really enjoyed this post! 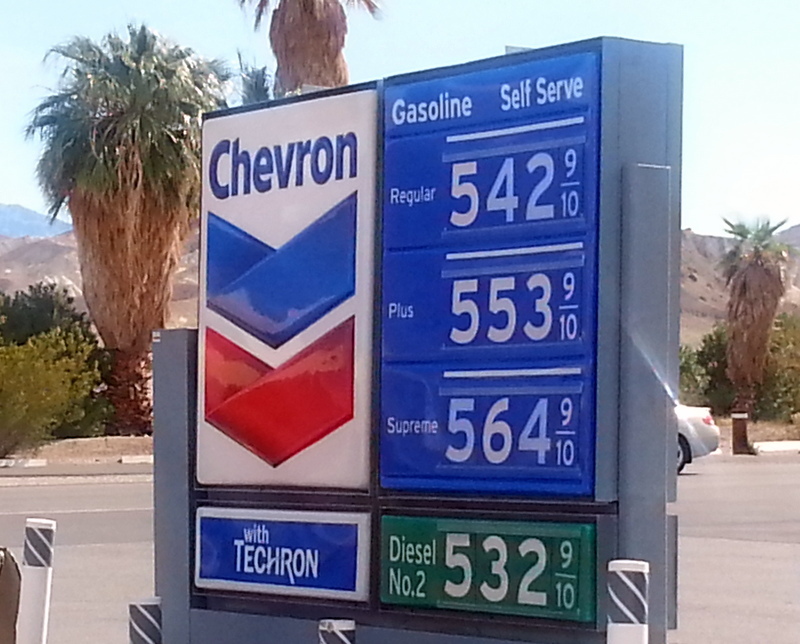 It would have been excruciating to get gas at that price. Happy we made that stop on our bikes! It certainly is a land of stark beauty! 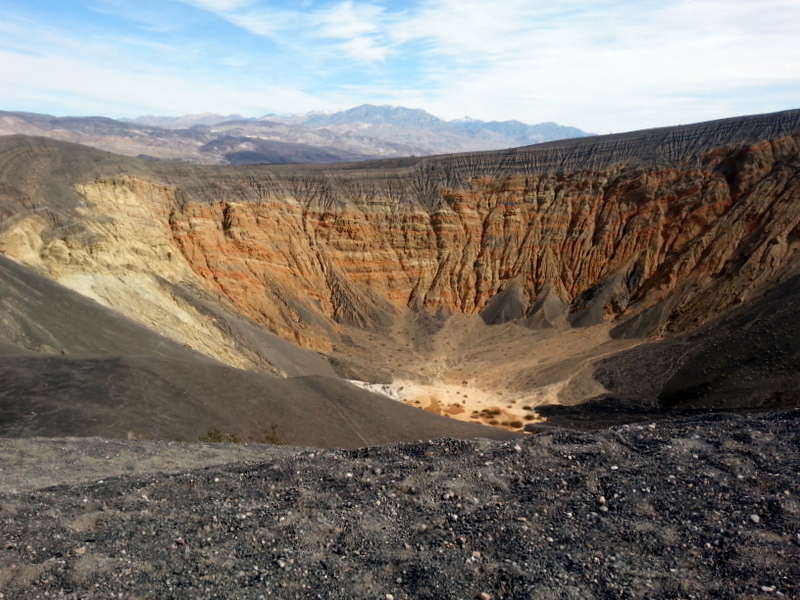 I had never heard of Ubehebe Crater before, not that I have ever been to Death Valley, but I’ve read a lot, and watched a few TV shows about it. 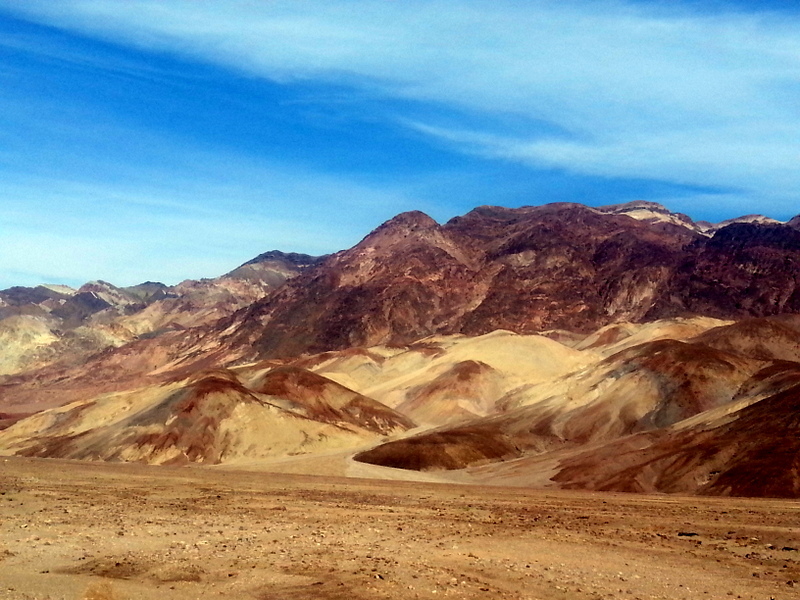 We were pleasantly surprised at the variety of beautiful sights in Death Valley. Although I hadn’t given it a lot of thought, I think I was expecting just a big, flat salt lick. Not true. There is something about your photos that gives architecture (both man made and natural) an unexpected dimension. It’s a pleasure just to stare at them and experience the unexpected depth. I feel as though I am looking at scenes from another planet when I look at your desert photos. The desert IS like another planet. 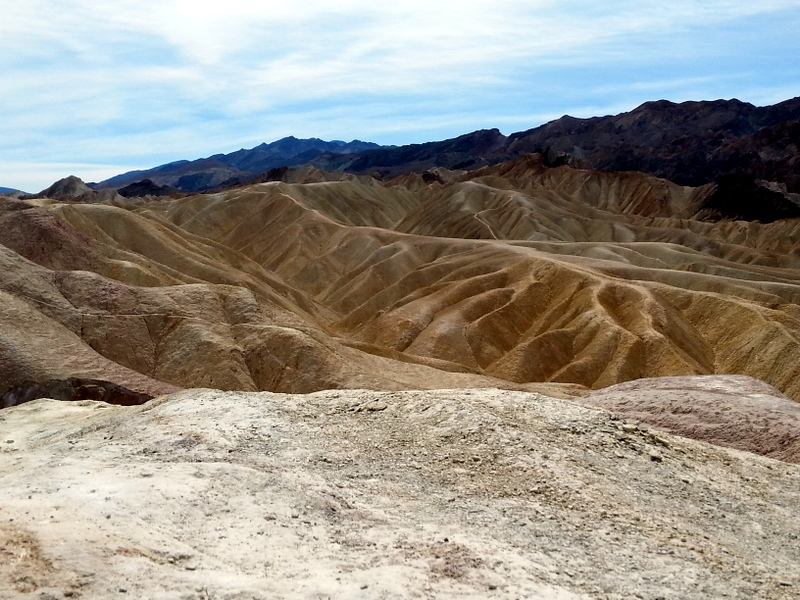 And Death Valley, being devoid of most vegetation is extreme. It is SO not Michigan (or Georgia)! I’m attracted to the odd things in life, and try to capture with my camera (actually my phone) what I see with my eyes. Thanks for your high praise. Love those pictures. When I went to School feet are shorter then a meter, am I wrong. 282 feet below sea-level and 855 meter below, doe’s not ad up. Look at the picture again.Thanks for sending your great stories. It’s actually fairly accurate if you reverse the units, as in 282 meters/855 feet. It’s then accurate within about 22 feet, but I’m sure that it’s not 855 feet below sea level!!! How could a sign like that go unchallenged???? The sign reads 85.5 (85 1/2) meters. The conversion is still off a little though. Close, but no cigar?? Can’t remem BC er exactly where that sign was. I probably took info off the brochure. Not enough bandwidth here to go back and check things out! Typos will kill me. Typing on tablet is hard sometimes! It was 282 feet for sure. No metric calculations here (but the expressway signs south of Tucson are all in km, not miles). That’s my major experience with the metric system. How sad. Hear your hip surgery went well. See you at TT in May. Beautiful pictures and dialog! I hope all of us never see that last sight! See you at the BRR! Hope I don’t know in advance when it’s all about to come to a screeching halt. 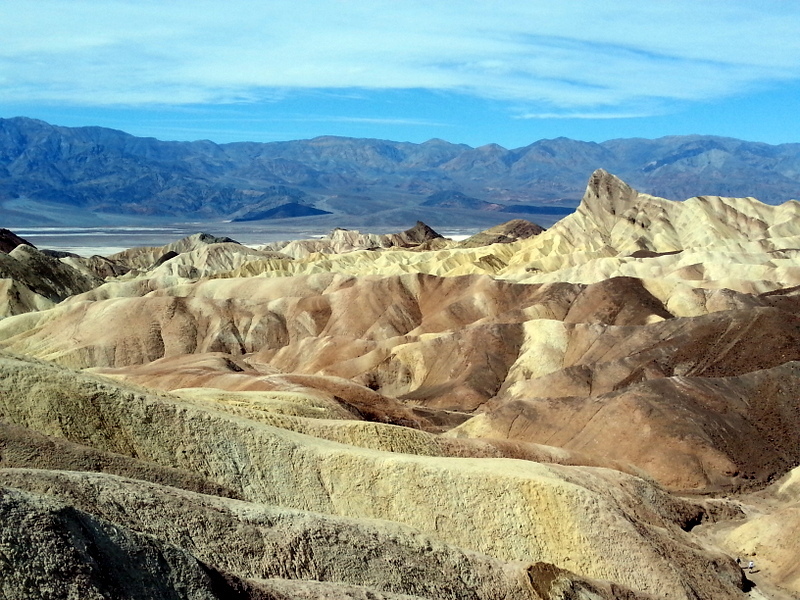 Want to believe that we’re on a huge roll…..
I’ve been to Death Valley twice!! It’s very cool! We used to live at Fort Irwin, just south of Death Valley so we know the deal. Harsh, but beautiflul country. It’s difficult to imagine how hard life must have been for the settlers. 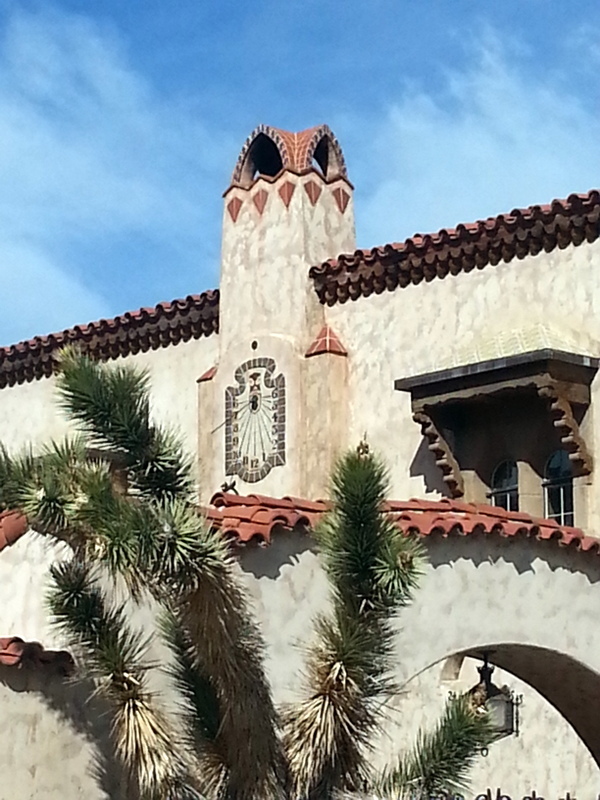 They told us at Scotty’s Castle that the temp never gets above 98 inside! Bare indeed. No cacti. Only a few creosote bushes and sagebrush. Loved the pictures! We have such a beautiful country. We feel blessed to be able to explore it. Hope I am mobile long enough in life to visit ask of the National Parks. Got off to a very slow start on this project for the first 60 years or so.